I am a huge worrier. A significant source of stress for me is the weekly grocery shopping bill. Our budget is tight, but we are by no means poor, and we can certainly afford our groceries. (It also helps that I am a faithful Aldi shopper!) But still - our funds aren't limitless. And we do have a budget. But recently, I realized that I already had the tool that I needed to fight my grocery shopping anxiety. The cold finally hit Missouri, and we pulled out our winter coats recently. For some reason, I've been wearing my old winter coat, which is still in alright condition. (I'll probably switch to my newer one soon, though...so much warmer!) The only major problem with my old coat was that the lining on the pockets was completely ripped. Every time I'd put something in the pockets, it'd get lost in the inner recesses of my coat. The other day, I finally caved and dragged my coat to my sewing table to repair it. I started by digging through the inner lining of my coat, and digging out the random things that had fallen there. To my surprise...I found my old knot rosary from college! It was always one of my favorite rosaries, and it had been missing so long that I'd forgotten all about it. 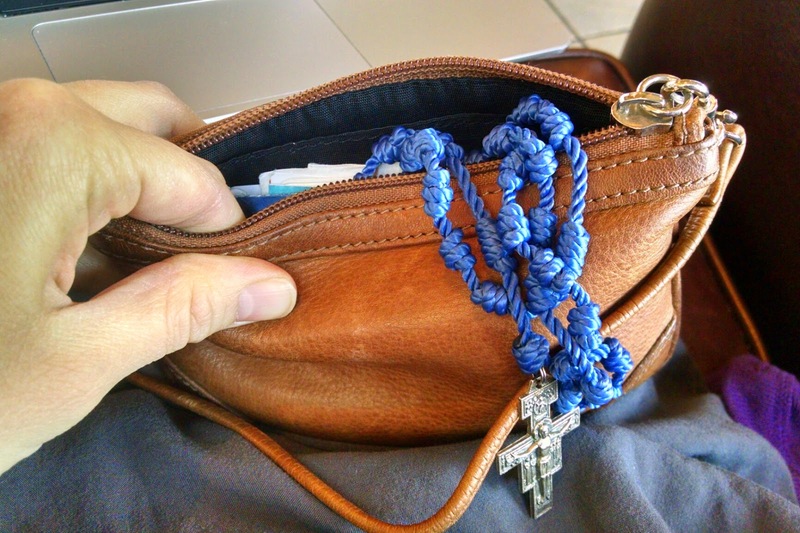 Since it's kind of soft, I decided to stash it in my wallet (because whenever I'm in a situation when I should be able to just whip out a rosary, I never seem to have one). So, there my rosary sat, nestled up to my debit card, and my credit card. I went to adoration at some point, and was glad that I actually had a rosary to pull out for a change. But mostly, I forgot that I had it in there. Last Thursday, I went grocery shopping with the girls. Therese is a classic 4-year-old, and is all about helping me in whatever way she can. (And she actually is a pretty big help with getting things off the shelves and putting them in the cart, and often she does reduce my work load a bit.) Maria is a classic 1-year-old, and is all about preventing me from being productive in whatever way she can. She's getting much better in public places, as she learns to respond to prompts I give her, reminding her to be quiet. But...she's 15 months old. And she has a big personality. So, add her into the mix of trying to keep track of a million things (including our family's dietary needs, which seem to be getting more complicated every month, as we try to sort through the causes and aftermath of my last bout of hyperemesis gravidarum). I've been trying different tricks to stay on budget (or at least close to on budget) - making a weekly meal plan, using an app to keep track of my grocery list (and avoid impulse buys as much as possible), and even pulling out my calculator app so I have a better sense of how much I'm spending before I get to the cash register. But add in all that with a wailing, hungry and tired 1 year old, and a 4 year old asking how she can help, and...it's a lot to keep track of. I always approach the checkout line with dread. Often the weekly total is more than I'd like, even though I am cutting corners and doing my best. Andrew - our budgeting guru - is awesome, and keeps reassuring me that the amount that I'm spending is totally fine...but I just want to do better, you know? So, this past week, I went up to the register to pay, feeling slightly stressed, and even more stressed when I heard the total amount I owed. I opened my wallet to dig out my debit card, and there, nestled beside it, was my rosary. I felt a moment of calm wash over me. I pulled out my debit card and paid. The stress returned a moment later, as I tried to bag my groceries to the tune of hungry baby tuning up, but that moment of calm was huge for me. I always feel like I need to be so in control of everything, am convinced that everything is my responsibility. But do you know what? It's not. A friend recently told me that it helps her to think about the fact that the truly big things in this world - she has no control over. All she can control are the little things right in front of her, and so she prays that God helps her keep track of those things. I often think that I have to do things perfectly - but I don't. All I can do is the best that I can do, and I must leave the rest up to God. Seeing that rosary in my wallet reminding me - I am not alone in this. God is providing for me, for my family. Figuring out all the details of everything, perfectly keeping to the budget - that is not always in my control. All I can do is my very best, and I have to leave the rest up to God. But do you know what? I can trust Him. He's got me covered. Since spending money is such a form of anxiety for me, I'm planning on leaving my rosary in my wallet. Every time I go to pay, I find such peace in being reminded that - ultimately - God will provide for my family. He always has, and He always will. 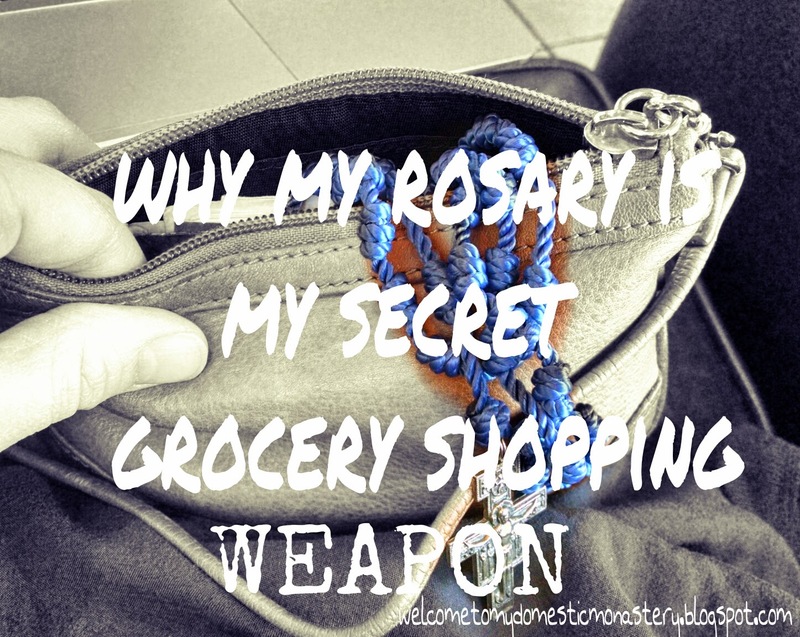 Such a great idea to have the rosary during grocery shopping trips. I too get stressed out with trying to stay under our weekly grocery budget.